A true work-a-holic, this leave-in conditioner, accented with Australian Silk Protein, puts in overtime to keep hair strong. Married to its job. burning the midnight oil. Any way you put it (which should be in your hair). 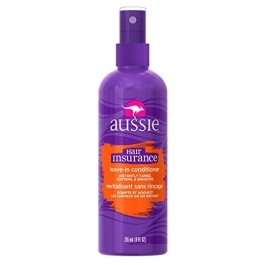 Hair Insurance Leave-in conditioner spray is always working hard to ward off hair-related accidents. Aussie. Add some Roo to your do. After shampooing, towel dry hair. Spray evenly to condition & detangle, and comb through. Do not rinse out. Style as usual.